It can be frustrating when students don't seem to get it. “Every year I teach them this and every year they get it wrong!”. This is a phrase I’ve heard from colleagues and from my own mouth. Then it dawned on me – if the students keep getting it wrong, maybe I’m teaching it wrong! Here’s an example. 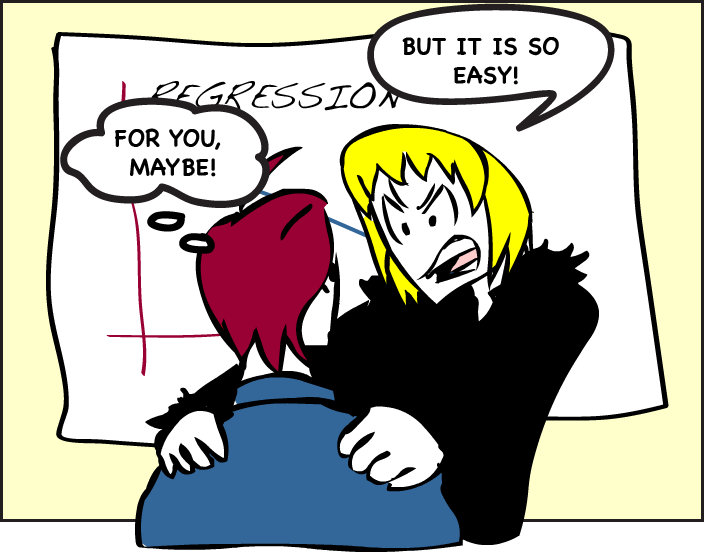 In linear regression I found that students often had trouble interpreting the slope. They would get it the wrong way around, or just not get it. Every year it was the same and I repeatedly groaned at incorrect interpretations in their work. Then it struck me that maybe it was my fault. Maybe I needed to think harder about why they were not getting it, and implement some changes. So I did. Consequently we now have a stronger emphasis earlier in the course on fitting lines and interpreting them correctly within multiple real-life contexts. Then later when we have addressed the concepts of hypothesis teaching in multiple contexts, we introduce regression. Students are now equipped to bring together their learning on line-fitting and on inference and hypothesis testing. And, happy day, they do! As a result of the redesigned syllabus, their final written reports are much improved and I am spared the annoyance of repeatedly grading incorrect statements. What do I mean by “teaching it wrong”? There are many ways we can teach something poorly (see I do know about adverbs, but “teaching it wrong” is a more memorable phrase). Some of them are given below, with suggested remedies. We can make incorrect assumptions about students’ prior understanding. I assumed students understood the meaning of a slope. They probably should have. But they didn’t, and there is no point in berating students or their previous teachers for their deficiency. It doesn’t help. If students need prior knowledge and don’t have it, then we need to teach it. (And not grudgingly!) We may think we don’t have time to teach the earlier material, but it is pointless pressing on if they are not prepared. A quick pre-test can help us assess when students are ready for the new knowledge. We can miss what the truly tricky aspects are. When we really understand something, it can be difficult to remember what was difficult. How many of us can remember learning to change gears in a car, a task that becomes automatic? One of the best ways to work out what is difficult is to be there when the students are learning. At university level it is customary to leave the one-on-one or small group teaching to graduate assistants. The problem is the professors miss out on understanding what is happening to the students in their class. For this reason I always take at least one tutorial group in any class I teach. Grading papers can also help identify what is causing problems. Teachers need to reflect and experiment. Teachers are smart people, but sometimes we don’t use our smarts well enough in our teaching. It is not good enough to just keep doing what we have always done even if everybody, including the textbook does it too. It is a source of interest to me how many statistics courses and textbooks still teach the normal approximation of the binomial distribution. Fair enough show that the binomial approaches the normal (if you must), but Excel will solve binomial examples just fine for any parameters I’ve given it. There is no need to approximate. We can fail to give enough examples for students to generalise – or have the examples create incorrect generalisations. A previous post talks about the need for repetition or practice in the construction of knowledge. Given the opportunity, students will entrench wrong interpretations by finding spurious rules and patterns. For example if all the minimizing Linear Program examples have only greater than constraints, students will form the idea that this is what must happen. Or if all examples testing means of weight loss are paired, students will use the context to judge, often erroneously. Well-thought-out sets of examples and exercises can really help, and give the students a sense of unfolding understanding. Along with many wrong ways, there are many wonderful, right ways we can teach something well. Our task is to find or create these ways, and when we do, the result for learner and teacher is joyful. When I began teaching I realized soon enough that understanding something and being able to teach it to someone else are not the same things at all. I think this is why it’s so important to check for understanding frequently, a “quick pre-test” as you say. When I fail to do this, I see the poor results from my assumptions. Thanks!